In general, all websites are freely viewable by anybody who wants to see them. Requiring a username and password to access various sensitive areas of your site allows you to restrict access to only a chosen few people who know the secret codes. In this tutorial I’ll present a method to secure a directory of documents by using a special Apache server configuration file. On top of this rather large chink in the armour, those pages will also be automatically indexed by search engines, leaving the private information accessible simply by searching for it. This special “.htaccess file”, which you may have encountered before if you’ve set up your own 404 error, is a configuration file for the Apache web server. It is just a text file with a special name that contains rules that your server will apply before it sends any files to a viewer of your site. These rules can change the URL of a page, create custom error messages, or in this case require a valid username and password to gain access to a certain area of the site. These configuration files work on a directory basis, so if your site is at www.example.com and you place the .htaccess file in the root directory (where your index.html homepage is), the entire site will be off-limits and all visitors will need a password to view anything. This is generally not what you want, and so you will create a .htaccess file within a certain directory. When you set up authorisation for a certain directory, that directory, all of its files, and any directories within it are all protected by this one file. You can have multiple different .htaccess file in multiple directories in your site if necessary. To create the file, open your text editor and save a blank file as “.htaccess” in the directory you want to protect, noting that the filename starts with a dot. Windows users may find that they are told they can’t start a filename with a dot. If you get this error, use your FTP program to create the .htaccess file on your server and edit it there instead. If you save that file now and try to access this part of your website, you should be presented with a dialog box in your browser asking you for your username and password. 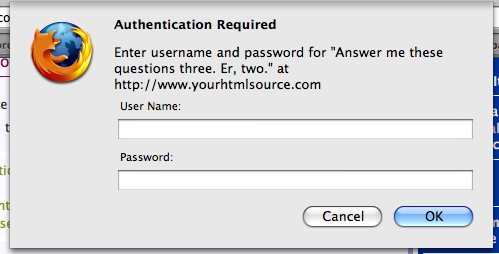 Of course, there is no right answer yet because we haven’t set up any users. If you press Cancel in the dialog you will be given the standard “401 Authorization Required” error response code. This is what everyone will see if they log in incorrectly. To add valid users to our authentication scheme, we use a second file called a .htpasswd file. This file will hold a list of usernames and passwords. Because it contains potentially sensitive information, you should store it in a place that’s impossible to access from the web. This means putting it somewhere else on the server outside of your “web” or “www” directory where your website files are stored. Your hosting company will be able to help you place this file securely so that no ne’er-do-wells can access it. As you can see, the password has been obfuscated into a strange form of gobbledegook. I derived this value (technically called a “hash”) by running the original password through an encryption program. There are lots of these available online (this one for example). You can add new users by adding new lines to this file, all in the form username:encryptedpassword. Now when you reload a file behind the authorisation wall, you enter a username and password into the dialog box. The server will encrypt this password again, and compare it to the encrypted version stored in the file to see if they match. If they do, you will be allowed to view the rest of the protected files as normal. Clicking a link like that will log you in as the user at the start of the URL. Of course, you need to make sure that only the intended person gets their hands on this information. Finally, to remove any password restrictions on your files, just delete the .htaccess file. For the final cherry on the cake, you can follow the steps in the 404 error tutorial, but instead set up a custom 401 error, so that users who log in incorrectly get a nicely-formatted error message. Keep Learning // Bandwidth Theft → Go! Go!